Every year, some two million parents in the US suffer the death of a son or daughter. The unnatural sequence of the child's preceding the parent in death creates a wrenching loss and overwhelming emotional and spiritual disorientation. Most of these bereaved parents find relief from their isolation only in the company of others like themselves. The Grieving Garden offers support, understanding, and, ultimately, comfort and hope from those who have sowed the same tears over the death of a child. 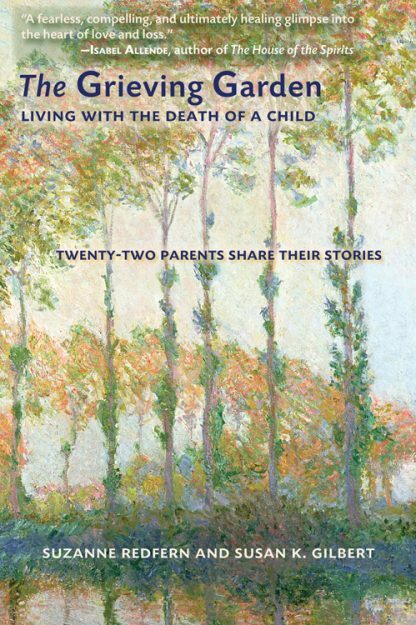 The Grieving Garden is a ground-breaking book that invites bereaved parents into personal conversations with a diverse group of fathers and mothers who share the same loss. The text is free of distracting and heavy-handed editorializing, "expert" opinion, or unwanted advice. Instead, readers are welcomed into a community of common understanding�one they may enter at will, at their own pace, for reassurance and hope. Suzanne Redfern is the president of Redfern Ranches, Inc., a diversified farming and cattle operation in the Central Valley of California. Her thirty-two-year-old daughter died of lung cancer in 1999. Suzanne lives in Palo Alto, California and on Redfern Ranch. Susan K. Gilbert was a pharmaceutical executive for many years in California�s Silicon Valley and is now very active in the community, serving on a board for the San Francisco homeless. Her eighteen-year-old daughter was killed in an automobile accident in 1993. Susan lives in the San Francisco Bay Area.